A considerably better synth than the one we first reviewed, yet still at the same very fair price. Combined arpeggiator/step sequencers. New effects. Improved filters. Since we reviewed version 1 of DiscoDSP's Corona synth just over a year ago, it's been through numerous updates and revisions and now stands at R4.6, although many of the updates really only qualify as point releases. "The biggest new feature to our mind is the trio of combined arpeggiators/step sequencers"
The biggest new feature to our mind is the trio of combined arpeggiators/step sequencers, one hardwired to volume, the other two freely assignable as modulation sources in the mod matrix. With a maximum of 32 steps apiece, all three are edited in one switchable window, with the two that aren't currently in focus always faintly visible in the background. Arpeggiations can be saved as presets, and the whole thing works brilliantly, enabling far more interesting and musical modulations than the previous mix of envelopes and LFOs (both of which have also been beefed up somewhat, incidentally) alone could manage. "The filters have also received a lot of love. There are now two of them, each boasting a total of 13 types and ten shaping modes"
The filters have also received a lot of love. There are now two of them, for starters, each boasting a total of 13 types and ten shaping modes, offering a choice of regular or zero-delay-feedback modes, the latter delivering a more 'analogue' sound at the expense of CPU cycles. 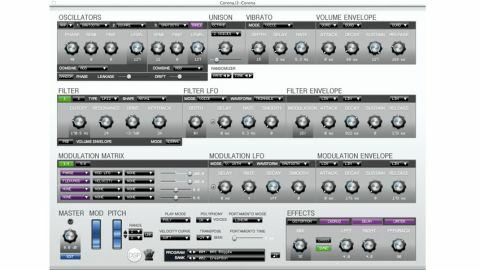 Not only do Corona's filters now sound even better than before, but they're considerably more versatile, too. The effects section has been bolstered with the addition of Chorus, Limiter and Distortion modules. The Distortion offers seven algorithms (including Sample & Hold and Quantize, for those hard-edged 'digital' sounds), features a Mix control for parallel processing and sounds fantastic, whether used gently or pushed hard. Beyond that, the list of less obvious tweaks and enhancements includes SoundFont import into the wave oscillators, new oscillator combination modes, better preset library organisation and an improved set of preset patches, and a 'Super 7' unison mode modelled on the Roland JP-8080.